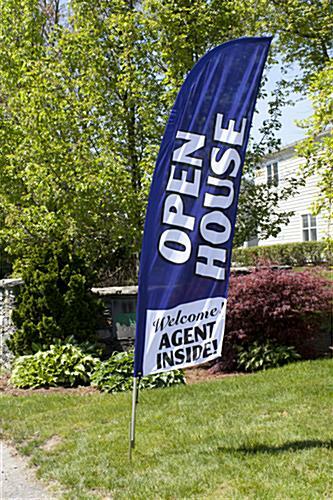 The Open House Flag Sells in Colors! Pre-Printed Blade Banners Ship Fast for Use at The Next Property Showing! 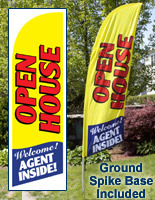 Each Open House Flag is Designed for Portability and Affordability! 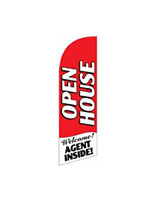 This open house flag feather banner is specifically designed for real estate agents whom are constantly showing different properties. 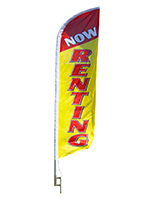 A black carrying bag that will easily fit into a car trunk is included with the purchase of these advertising banners. 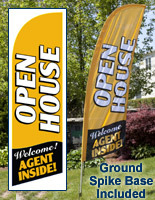 All components of this open house flag that is portable break down to fit compactly inside the bag. The bag's interior has slots for all the various pieces so they stay neatly organized, and do not clang together while being transported. 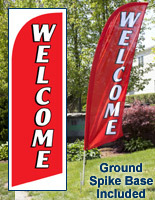 This blade banner is an open house flag that comes with an aluminum and fiberglass pole. The top (2) sections of the pole are fiberglass, while the bottom (2) sections are aluminum. There are advantages to purchasing this open house flag for sale, oppose to a more expensive model. Primarily, these real estate banners cost a fraction of what similar displays with all fiber glass components do. 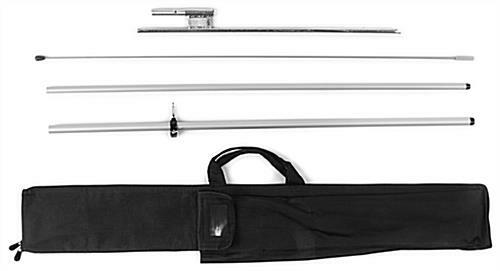 The swooper banner, open house flag also includes a ground spike that securely anchors into the ground. A cord then attaches the banner to the pole to ensure the pennant does not fly off.